Worf: "You look for battles in the wrong place. The true test of a warrior is not without. It is within." This surprisingly good episode told us a lot about Worf and his backstory, and gave us a few interesting hints about what's going on with the Klingon Empire. Even though Worf connected with Commander Korris and Lieutenant Konmel, he never once seemed tempted to throw away his career in Starfleet to romp about the galaxy in the Enterprise's stolen battle bridge. For Worf, it is all about "duty, honor, loyalty." He is committed to Starfleet, and that is that. But Worf's isolation most definitely exists. Just as Spock was the only Vulcan in Starfleet, obviously a deliberate parallel, Worf is the only Klingon. As a child, Worf was rescued from a Romulan attack at Khitomer by a human Starfleet officer, and that officer and his wife raised Worf at the Gault colony. Worf mentioned that he was adopted by humans before the "age of inclusion" without mentioning a number, but it sounds like something that would be connected to Klingon adolescence. And yet, Worf isn't just a human who looks like a Klingon. He is familiar with Klingon culture and identifies strongly with it. 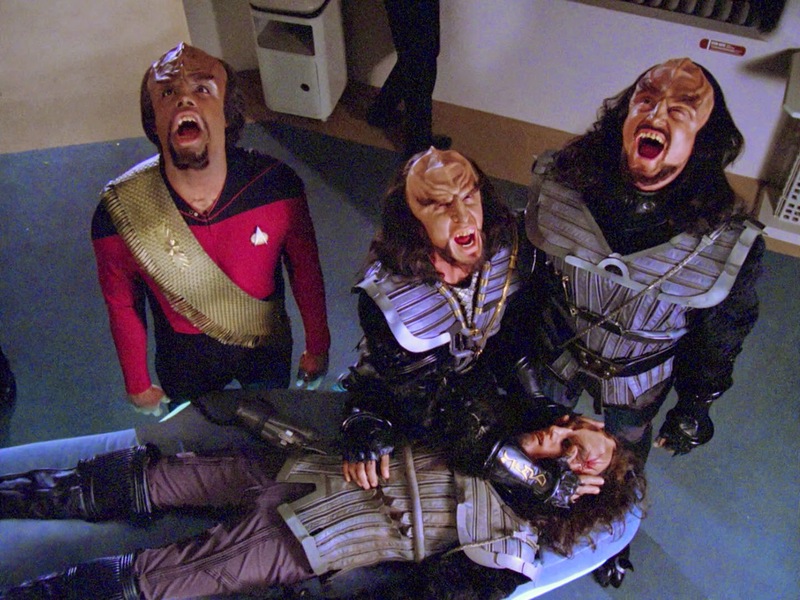 Here, we got the Klingon death ritual that involves holding the dying person's eyes open and screaming so that the afterlife knows a Klingon warrior is on his way. (Is it just for guys?) We also learned that for Klingons, the body is completely unimportant after death. I liked the detail that Klingons consider hostage-taking to be cowardly, although that didn't apply to Korris capturing the dilithium chamber and threatening to take it out, killing everyone on the Enterprise along with it. Including a whole lot of kids. Tell me again why there are children on the Enterprise? So some Klingons aren't happy about peace with the Federation. That makes sense. How did that peace happen? At this point in the series, we don't know. It doesn't seem that Klingons would be the type that would seek peace with the Federation, and Korris and Konmel certainly weren't on board with an alliance with those soft, icky humans. The B plot with Geordi and his VISOR connecting with the view screen as the away team explored the severely damaged Talarian freighter was a lot less successful than the A plot. What Geordi sees is interesting — especially that intriguing bit about Data having an aura — but wouldn't that sequence have been better served by just taking a teeny tiny futuristic camera along? Geordi was able to see metal fatigue in the hull, but wouldn't a tricorder do the same thing? For that matter, Data is a living computer. Shouldn't he be able to transmit what he sees? The Geordi and Worf plots were connected by Picard, who observed in a much too obvious way that he was learning a lot about both of them. But Picard did allow Worf to represent the Federation during the discussions with Commander K'Nera, and that was no small thing since any sort of unpleasant incident could have damaged relations with the Klingon Empire. Picard never appeared to doubt Worf's loyalty, and that reminded me of another Spock parallel: Kirk's unswerving faith in Spock in the classic original series episode "Balance of Terror." -- Stardate 41503.7, in the Neutral Zone. The waylaid Talarian freighter was called the Batris. -- Korris and Konmel were incarcerated in the Enterprise's brig, which was an empty room with a bench in it. They managed to escape by constructing what looked like a high tech dreidel with bits of their belts and shoes. Okay, it was a disruptor, but wouldn't it have been cool if it had been a dreidel? -- Worf mentioned that he and his foster brother attended the Academy, but his brother dropped out. -- Commander K'Nera invited Worf to join the Klingon version of Starfleet somewhere down the line. -- Some of the details in this episode connect to the sixth Star Trek movie, The Undiscovered Country, which didn't come out until 1991. -- There's a glass floor in the dilithium chamber? Very dramatic way for Korris to die, but shouldn't there be, um, some sort of high tech transparent plastic instead? Perhaps transparent aluminum? -- Commander Korris was played by Vaughn Armstrong. This was his first Star Trek appearance, but most certainly not his last. While this was his only role in Next Gen, he returned a dozen times as different characters in the other Star Trek series, occasionally but not always under alien makeup. -- I liked those gray military Klingon costumes. Although they did make Worf's gold sash look tacky. I enjoyed this episode as well although some of the scenes were still a bit much. The Klingons are a central part of the TNG universe and it was fun to get to know them. I always wanted them to explain how the Klingons had changed from TOS but I guess that involves suspending disbelief.